Dan Nolan PhD - Sullivan, Nolan and Associates, P.C. Since 1988 Dr. Nolan has been a Clinical Psychologist working in Washtenaw County. He specializes in the evaluation and treatment of children, adolescents and adults. 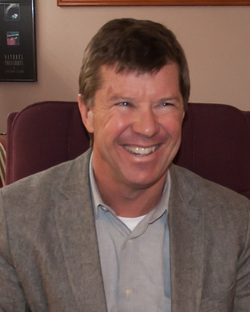 Dan obtained a Master's Degree from Marquette University and a PhD from Bowling Green University in 1985. His Internship was done at Children's Memorial Medical Center in Chicago with an emphasis in Child Clinical and Pediatric Psychology. He arrived in Ann Arbor in 1988 and has been practicing in the area ever since. Dan is married and is the proud father of three children. He currently sees patients in our Ann Arbor and Plymouth offices. Dan's personal statement: Approximately half of my practice involves therapeutic work. Finding a good "fit" with a therapist can have a significant impact on achieving a successful outcome. I strive to help each client discover and harness their unique strengths in addressing their problems. Therapy tends to be oriented toward active problem-solving. I have extensive experience working with depression, anxiety disorders, ADHD through the lifespan, and various social and behavioral difficulties. When working with adolescents and adults, I often utilize cognitive/behavioral therapy that is both pragmatic and empirically based. With children, parent/family therapy is frequently indicated. This may be coordinated along with individual work depending on the age of the child and the issues at hand. This approach is strongly supported by research on childhood disorders. Psychological, Learning, and Neuropsychological Evaluations are tailored to the specific concerns of the individual. Thus, a fixed battery is not exclusively utilized. While comprehensive, this approach proves to be both time and cost effective. The clinical evaluation profile assists the differential diagnosis and guides the treatment approach. Dr. Nolan has conducted over 100 presentations, in-services and workshops for parents, educators, physicians, and other professionals over the past 20 years. Topics include: ADHD, Nonverbal Learning Disabilities, Social Skills Training, Parent-Teacher Intervention Alliance. He has also been a contributor to CHADD since 1991. From the parents of a 10-year-old: Our son is a unique and complicated child that has struggled with attention and social issues. Dan has been a tremendous help to our son and our family. He took the time to truly understand our son, including observing him at school, in order to devise an appropriate plan of care. He met with our son’s teacher and other administrators to make sure that we, as parents, teachers, and other school staff were all on the same page in carrying out the plan we had come up with. Dan is very accessible, professional, and caring. We feel that our lives and our son’s life have improved as a result of his help. From the parents of an 8-year-old: We wanted to express our sincere thanks of your work with our son over the past few months. Our son responds so well to your positive, insightful, and good-humored approach. We have seen much marked improvement in his behavior at school and at home. He is calmer, more mature, and more confident, now that he has learned new ways of handling frustration and disappointment. We know that much more work needs to be done, but we thank you for the encouraging progress we have seen. From the father of a 17-year-old: Dr. Nolan just has a “way” with teenagers. My son liked him from their first meeting together. More importantly, Dr. Nolan gave my son fresh approaches to working on his behavioral issues. The strategies he gave us as parents worked beautifully. My wife and I highly recommend him. From an adult: The fast pace, high expectations, difficult people, and my personal expectations to succeed in my career have caused an enormous amount of stress in my life. The feeling of giving up, not being motivated, and having a negative outlook on my career and personal life made me feel as if I was stuck in a rut. About to throw in the towel with my career, I went to speak with Dr. Dan Nolan. Immediately, his excellent advice and ability to make me see the positives in life have allowed me to better deal with stress. He is a professional who is caring and knowledgeable. I highly recommend Dr. Dan Nolan and thank him for his services. From a parent: Dan Nolan is a wonderful therapist. Kids usually sense immediately that this is someone they can talk to. He uses just the right amount of humor to keep them engaged and willing to work with him. His practical suggestions to parents for working with their children are helpful, his strategies work, and his results are indisputable! From the mother of a 7-year-old: Our 7-year-old has made dramatic improvements in his behavior (at home and in school) since we had counseling with Dr. Nolan back in October, 2011. The behavior plans that we set up have worked beautifully, and have even continued to work 6+ months later. This has allowed our son to focus more on his schoolwork. The advice from Dr. Nolan on improving our parenting skills has been invaluable. Dr. Nolan has made quite a positive difference in our son's life. I would not hesitate to recommend Dr. Nolan to other parents with kids that are struggling with behavior issues and/or schoolwork. He is truly a professional. From the parents of two boys: Dear Dr. Nolan, Thank you for all your services, you have been extremely personable and knowledgeable. You have a way of connecting to kids, and that is rare. You are the only therapist my kids liked to talk to and we have tried a few ... Thank you for your prompt care and good advice. We appreciate how thorough and “right on” your diagnosis was for my sons. We always refer (other parents) to you as a great doctor to help ADHD kids.